here's a lot of cumin here, but that's the whole point of the dish. The spice helps give the chicken a gorgeous, blackened crust. Beat the chicken breasts lightly with a rolling pin to flatten. Cut each into 3. In a dry frying pan over a medium heat, roast the cumin seeds for the marinade for a couple of minutes, until fragrant. Crush roughly in a pestle and mortar, then mix with the other marinade ingredients. Apply to the chicken. Refrigerate for 2½ hours. Preheat the oven to 200°C, gas mark 6. Put the chicken in a large, shallow ovenproof dish and cook for 12-15 minutes or until done. It's important not to crowd the chicken so you may need to do this in two batches. Then, preheat the grill to high. Drizzle the chicken with butter and finish with 5 minutes under the grill, turning once. 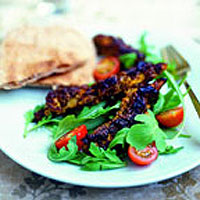 Arrange the rocket and tomatoes on 8 plates, top with the chicken, and serve at once with gobi matar and raita, and the pitta.